Teodor Axentowicz (1859–1938), Under the Burden of Adversity (date not known), further details not known. Wikimedia Commons. Seen from Western Europe, the Vienna Secession may seem distant and of little importance, except in its indirect influence on Art Nouveau through Alphonse Mucha. That is a very parochial view, and ignores altogether the rich art histories of central and eastern European countries, including Germany, Austria, Poland, Hungary, and more. Of the forty-nine co-founders of the Vienna Secession, seven were based in the Polish city of Kraków. They included Professors Jacek Malczewski, whose work I have covered briefly here, and Teodor Axentowicz (1859–1938), whose art is now almost unknown outside Poland but at the time was internationally renowned. This article looks at some of his oil and pastel paintings. Axentowicz was an Armenian (name Թեոդոր Աքսենտովիչ) who was born in Braşov, then in Hungary but now in Romania, and who specialised in the depiction of the Hutsul people, who live in the Carpathian Mountains, in the Ukraine. He trained initially at the Academy of Fine Arts in Munich, Germany, between 1879-82, then moved to Paris to study under Carolus-Duran and others until the early 1890s. His multi-national background and training was by no means unusual among artists in central and eastern Europe, either. Teodor Axentowicz (1859–1938), The Anchorite (1881), oil on canvas, 129 x 95 cm, Muzeum Narodowe w Warszawie, Warsaw, Poland. Wikimedia Commons. The Anchorite (1881) is one of his earliest oil paintings, made whilst he was still a student in Munich, and a superb achievement. 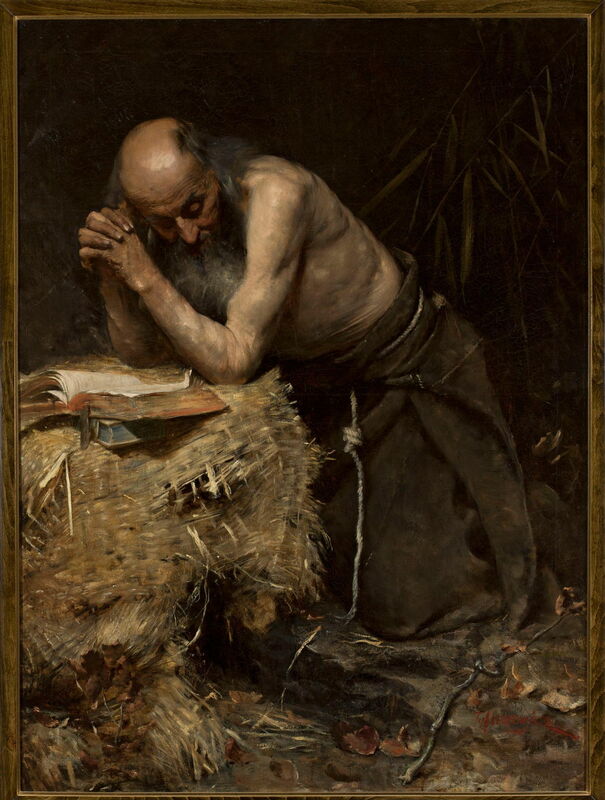 Painted from a model, rather than a real religious hermit, Axentowicz shows asceticism in every detail, down to the knotted veins of his forearms. At the end of his training in Munich, Axentowicz paid his first visit to the lands of the Hutsul people, in the Carpathian Mountains of the Ukraine. Now numbering only about 25,000, they form a substantial proportion of Ukrainian highlanders, and have their own distinctive culture. Teodor Axentowicz (1859–1938), Pogrzeb huculski (Hutsul Funeral) (1882), oil on canvas, 86 x 115 cm, Private collection. Wikimedia Commons. 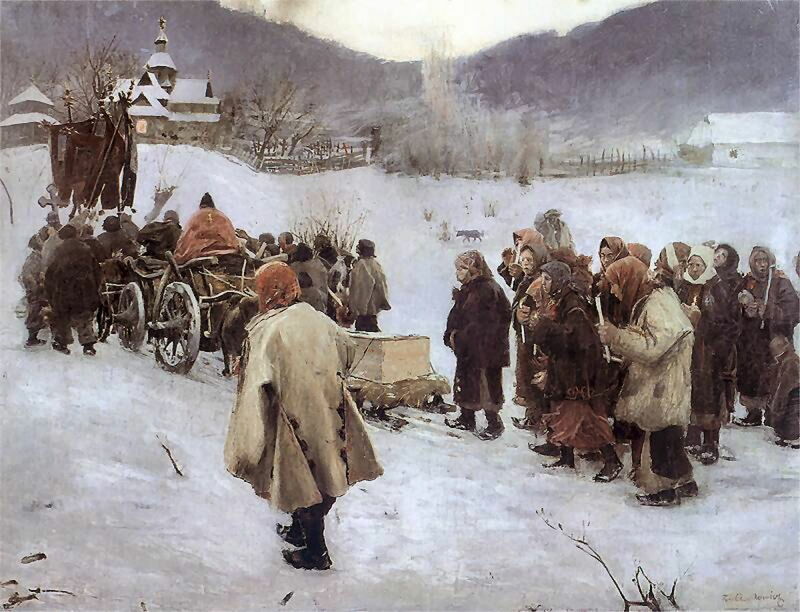 His oil painting of a Hutsul Funeral from 1882 shows the Hutsul in the rigours of winter, the coffin being towed on a sledge behind a cart, and the mourners clutching candles as they make their way through the snow to the stave church in the distance. Teodor Axentowicz (1859–1938), Przy studni, U studni w Wenecji (At the Well, At the Well in Venice) (1883), oil on canvas, 49 x 32.5 cm, Muzeum Narodowe w Warszawie, Warsaw, Poland. Wikimedia Commons. Axentowicz also visited western Europe, and in 1883 painted this view At the Well in Venice, a marked contrast. 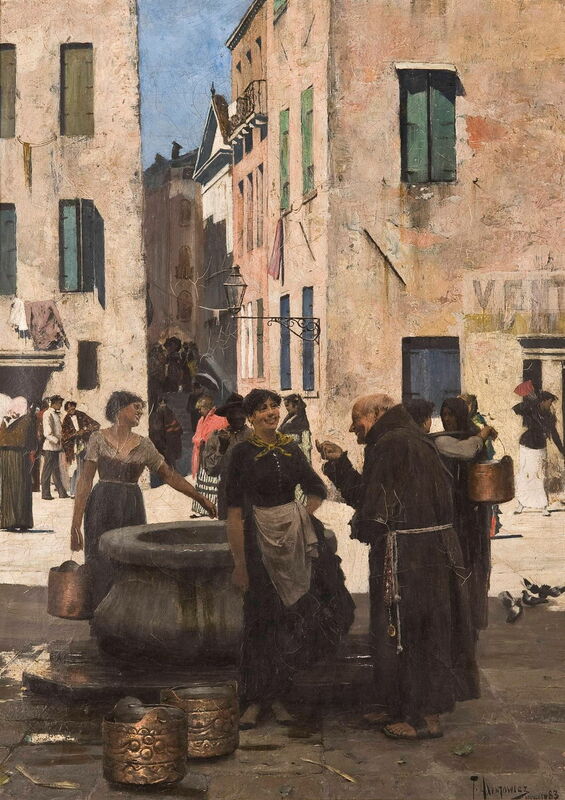 The conversation taking place between the monk and the woman at the well forms its intimate centrepiece, and is far more representative of the real city of Venice than the more popular views of Piazza San Marco and famous canals. Teodor Axentowicz (1859–1938), Samotna w mieście. 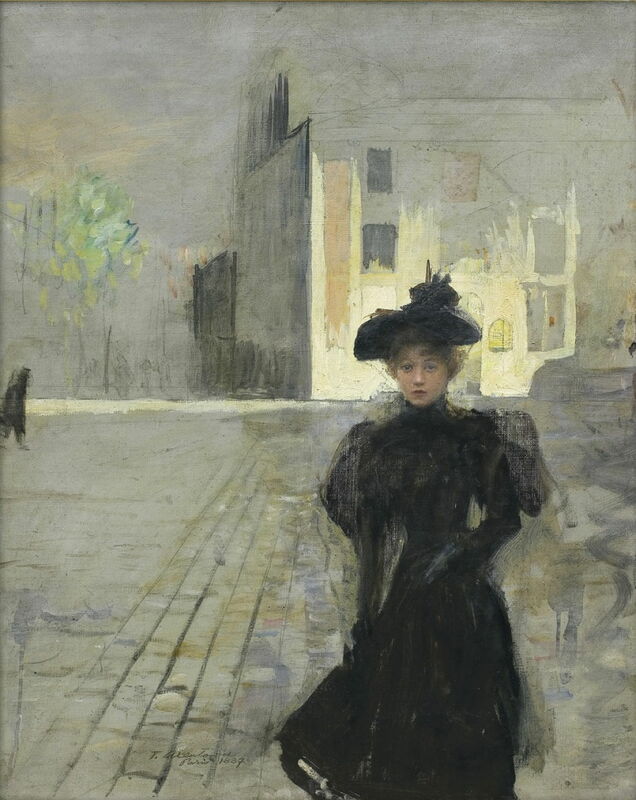 Paryżanka (Alone in Paris) (1887), oil on canvas, 55.3 x 46 cm, location not known. Wikimedia Commons. His time in Paris was perhaps less idyllic, if Alone in Paris (1887) is anything to go by. A quick oil sketch of a woman clad completely in black, she stares vacantly towards the viewer. In 1893, he married Iza Gielgud, a member of the famous British theatrical family, and appears to have stayed in London frequently during the 1890s. Józef Mehoffer (1869–1946), Portrait of Iza Axentowiczowa née Giełgud (1907), oil on canvas, 95 × 68 cm, Muzeum Narodowe w Warszawie, Warsaw, Poland. Wikimedia Commons. 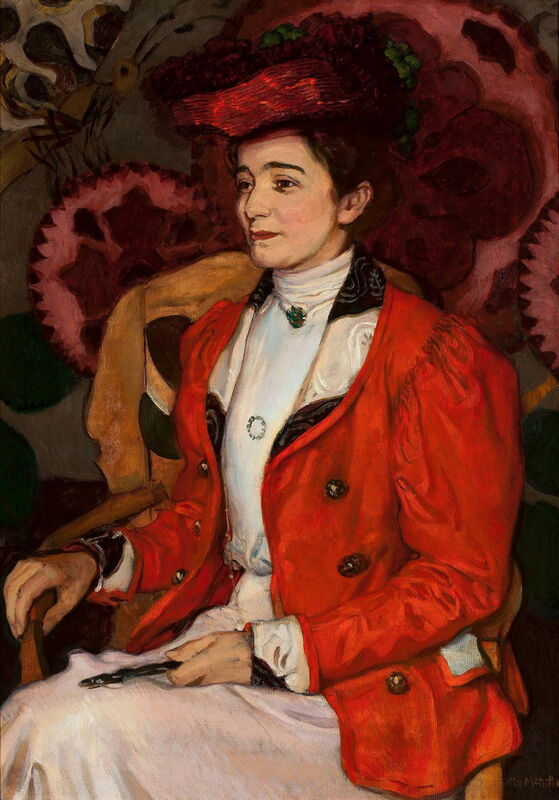 This rather later Portrait of Iza Axentowiczowa née Gielgud (1907) was painted not by Axentowicz, but by another Polish member of the Vienna Secession, Józef Mehoffer, who also designed the tapestry seen in its background. Iza lived from 1875-1957, and her famous Shakespearean nephew Sir John Gielgud lived from 1904-2000. In 1894, Axentowicz collaborated with specialist panorama painters Wojciech Kossak and Jan Styka in their early work on the vast Racławice Panorama, in Wrocław, Poland, then settled in Kraków, where he was appointed professor in Poland’s leading Academy of Fine Arts of the day. Teodor Axentowicz (1859–1938), Kołomyjka, Oberek Taniec ludowy przed domem (Oberek Folk Dance in Front of a House) (1895), oil on canvas, 85 x 112.5 cm, Muzeum Narodowe w Warszawie, Warsaw, Poland. Wikimedia Commons. 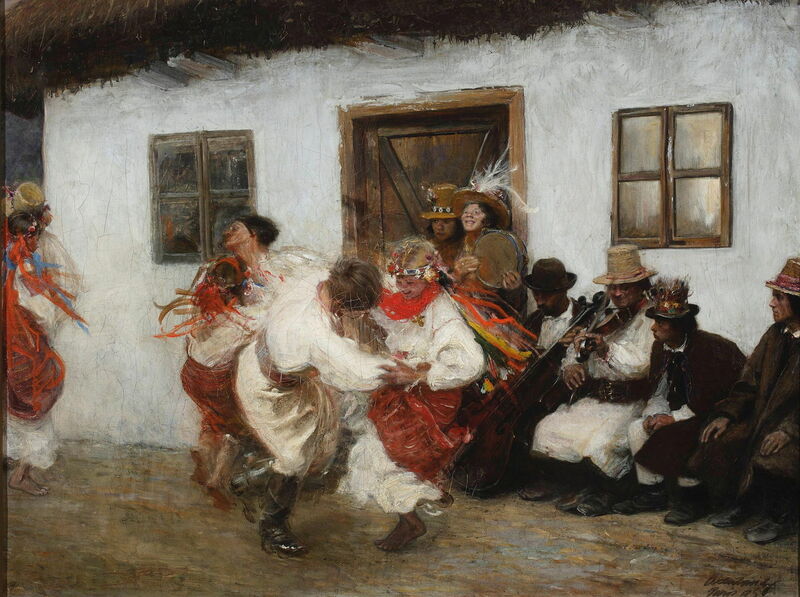 In Poland, Axentowicz also concentrated on rural people and folk motifs, such as this brilliant oil painting of Oberek Folk Dance in Front of a House from 1895. The Oberek is the second most popular Polish folk dance after the polka, and consists of a fast and vigorous succession of lifts and jumps, which the artist shows well here. Note how most of the dancers are barefoot. 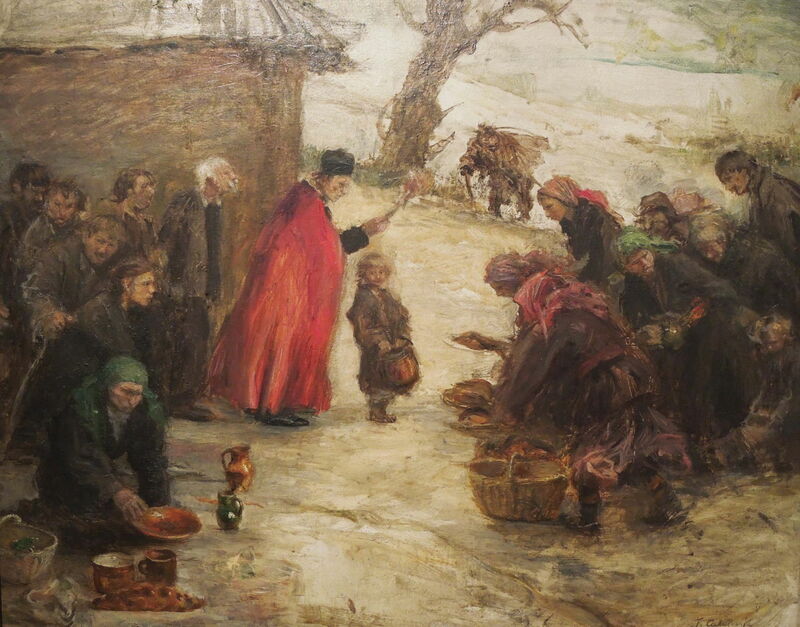 Teodor Axentowicz (1859–1938), Święcenie około (Blessing) (c 1899), oil on cardboard, dimensions and location not known. Image by Ablakok, via Wikimedia Commons. Blessing (c 1899) is also set deep in the country, with the priest apparently blessing the food brought to him by the women of the village. In the left foreground is a splendid plaited loaf or pie dish, behind which stand the men. In the distance, someone is trudging up carrying a load of kindling. Teodor Axentowicz (1859–1938), Golden Angel (c 1900), further details not known. Wikimedia Commons. 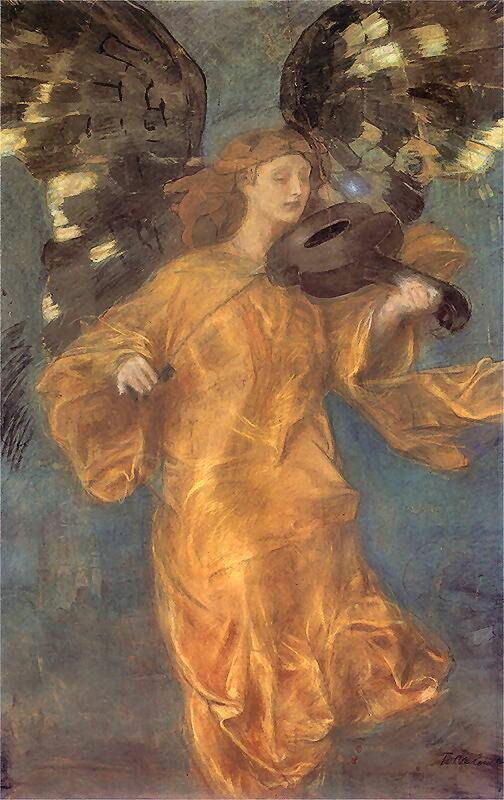 I include Golden Angel (c 1900) for its unusual working of the folds of fabric, and the wings of this angel. It is possibly one of his earlier works made in pastels on a watercolour background, which came to dominate his output from about 1900. 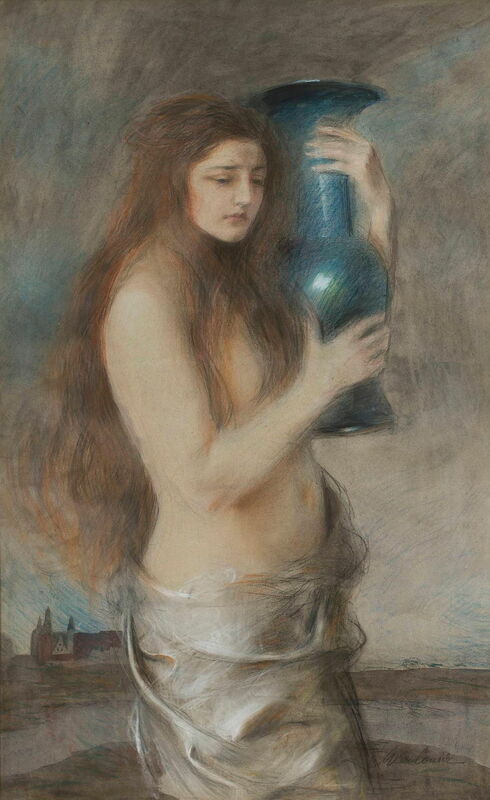 Teodor Axentowicz (1859–1938), Dziewczyna z niebieskim wazonem (Łzy) (Girl with a Blue Vase (Tears) (1900), pastel, 120 x 76 cm, Muzeum Narodowe w Warszawie, Warsaw, Poland. Wikimedia Commons. With these wonderful pastels comes a deep sadness, as in this Girl with a Blue Vase (Tears) (1900). I suspect that the landscape background in the lower quarter of this work was painted first in watercolour, and pastels stroked over the top, giving this fine and frangible appearance. Teodor Axentowicz (1859–1938), Wizja – wspomnienie, Starość i młodość, Starzec i zjawa młodej kobiety, Starzec z dziewczyną (Vision – Memory, Old age and youth, The old man and the ghost of a young woman, An old man with a girl) (after 1900), pastel and watercolor on paper, 91.5 x 68 cm, Muzeum Narodowe w Warszawie, Warsaw, Poland. Wikimedia Commons. 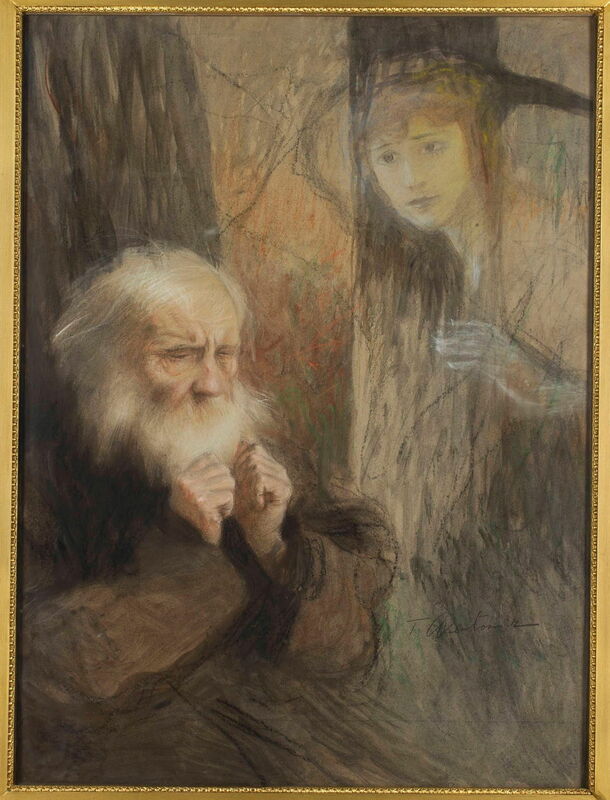 In Vision – Memory, also known as The old man and the ghost of a young woman and other titles (after 1900), Axentowicz again achieves great effects with the combination of pastel over watercolour. The old man is reminiscent of his early Anchorite above. In the early twentieth century, Axentowicz exhibited at, and was recognised in awards from, a succession of major international exhibitions, including the World’s Fair in St Louis in 1904. In 1909, he was admitted as a knight to the Order of the Iron Crown by the Emperor of Austria, and was later given similar state recognition in Poland. 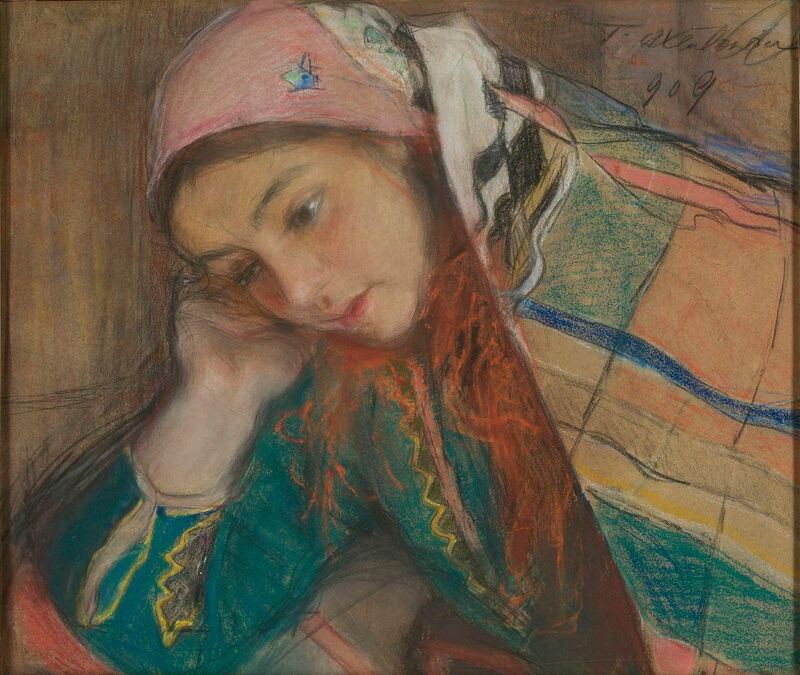 Teodor Axentowicz (1859–1938), Portret dziewczyny w stroju krakowskim (Portrait of a Girl dressed in Krakow) (1909), pastel on paper, 33.5 x 44.5 cm, Muzeum Narodowe w Warszawie, Warsaw, Poland. Wikimedia Commons. 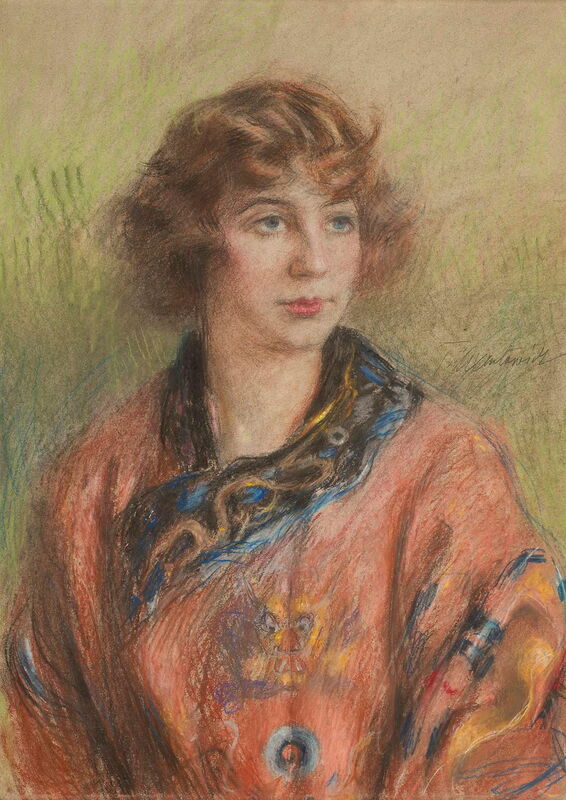 Axentowicz’s pastel portraits of young women in various types of dress are also quite unusual. This is a Portrait of a Girl dressed in Krakow from 1909. Teodor Axentowicz (1859–1938), Portret kobiety w chińskiej ślubnej szacie kobiecej “longpao” (Portrait of a Woman in a Chinese Wedding Dress of a Female “longpao”) (1920-30), pastel, 68 x 50 cm, Muzeum Narodowe w Warszawie, Warsaw, Poland. Wikimedia Commons. I don’t know the story behind this pastel Portrait of a Woman in a Chinese Wedding Dress of a Female “longpao” (1920-30), but she appears to be Polish, and the dress which she is wearing is of the type often known as Long Pao, meaning a formal domestic robe, often bearing images of dragons. Although Japonism(e) is often considered prominent at this time in the arts, there was also great interest in arts and crafts from China. The last two paintings by Axentowicz are undated, but appear to come from after about 1900 too. Teodor Axentowicz (1859–1938), Dziewczyna z gromnicą (Girl with a Candlestick) (date not known), oil, 32 x 24 cm, Muzeum Sztuki w Łodzi, Łódź, Poland. Wikimedia Commons. 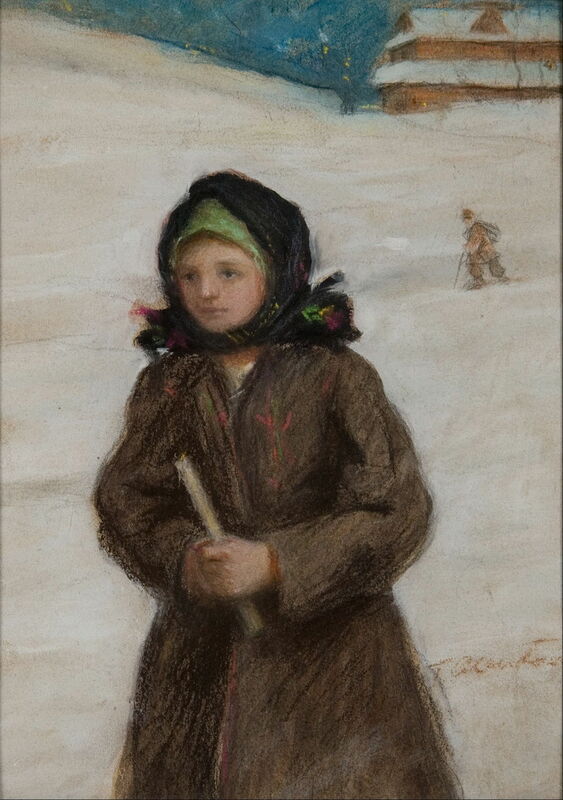 Girl with a Candlestick appears to be another work in watercolour and pastel, showing a young woman holding a candle, as she makes her way through the snow. Like the woman of Alone in Paris, she seems lonely and sad. But for me, the greatest of his watercolour and pastel works is Under the Burden of Adversity. 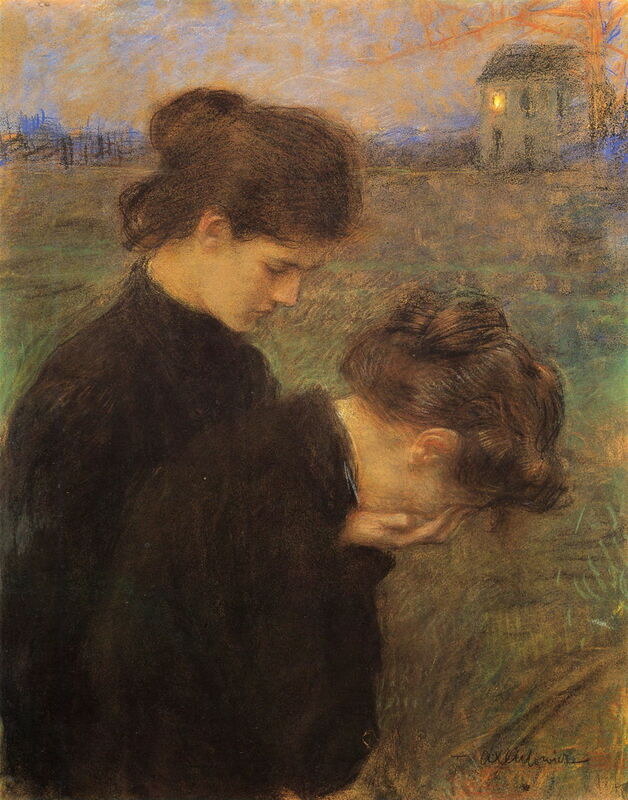 One of the two women in the foreground has broken down in tears, her fingers covering her eyes, and her head bowed in grief. The other stands beside her, outwardly less affected. In the distance is a house, light glowing at a bedroom window. Has their father just died, perhaps, as the early dawn starts to colour the sky? I think that I will experiment with this combination of watercolour and pastels: in Axentowicz’s skilled hands it can result in some very varied textures and effects. Teodor Axentowicz died in 1938, and most of his paintings remain in Poland. His depictions of the Hutsul remain among the most important records of their culture before they were engulfed by the Soviet state. Posted in General, Life, Painting and tagged Axentowicz, Carolus-Duran, Carpathian, Malczewski, painting, pastel, Secession. Bookmark the permalink. Tim Miller at wordsandsilence pointed me in this direction, glad he did. Great blog.